Forrás: Metro. Szerző: Richard Hartley-Parkinson. 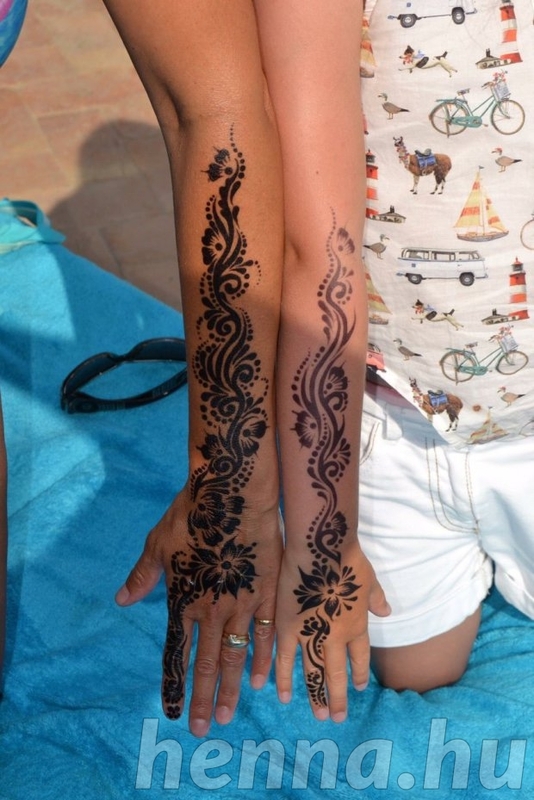 A young girl has been left with permanent scars after she got a black henna tattoo while on holiday in Egypt. Madison Gulliver got the tattoo done while at a hotel but after returning to the UK she complained that it had become itchy. It then erupted in painful blisters that have had to be cut away at a burns unit and she is now scarred for life. Pictures show her crying in pain as she has the blisters removed in hospital. Black henna tattoos can contain high levels of paraphenylenediamine (PPD), a toxic chemical. Martin, a manager for Royal Mail, from the Isle of Wight, said: ‘She is potentially scarred for life after getting a black henna tattoo. 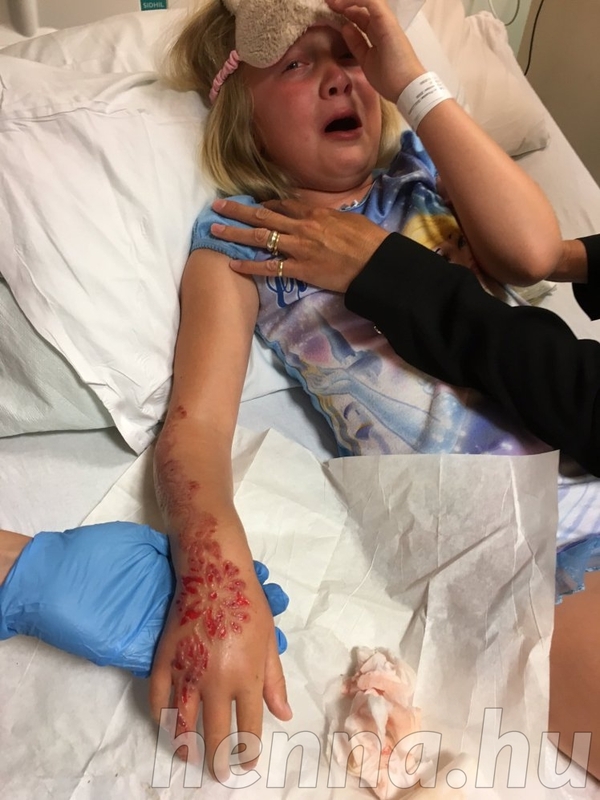 ‘The tattoo was done in the hotel’s salon and they claim it’s not the henna and that it’s my daughters skin. She has blisters from her finger to her elbow and is in so much pain. ‘We were entirely unaware of the dangers and I think they should warn of this in the brochures. ‘I think it’s partly my fault because I didn’t know about it, but also the fault of the salon because they are using dangerous chemicals on children. Martin said he had a great holiday with wife Sylvia, 43, son Sebastian, nine, and daughter Madison, seven, until the beginning of the second week. Postie Sylvia had to be rushed to hospital with a gall bladder infection, and although everything worked out fine, the family spent two days of their holiday in hospital. As a treat for being so well behaved, Martin decided to pay for both of the kids to have a black henna tattoo. ‘We noticed there was a small patch on the top of the tattoo that was raised but we couldn’t see any redness,’ he said. ‘The next morning the whole tattoo was starting to get itchy, so we washed it off which revealed a rash in the outline of the tattoo. 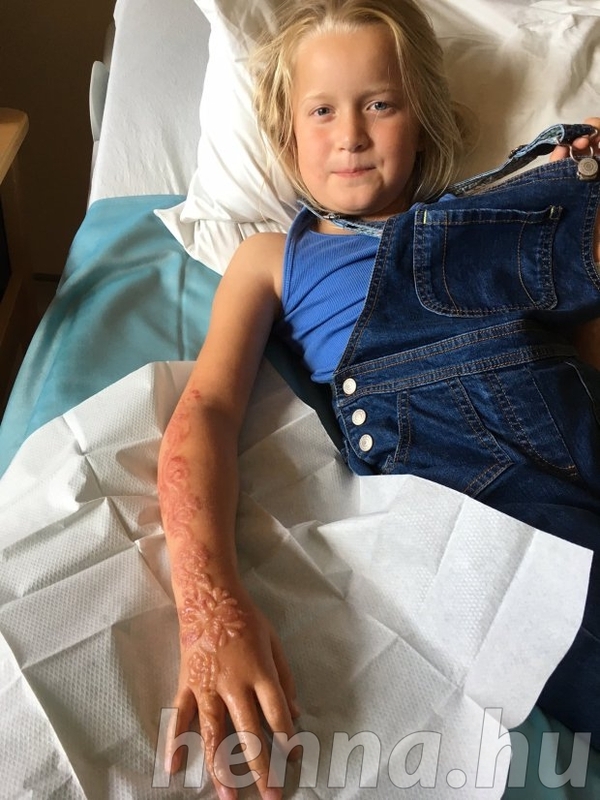 Doctors carried out a test on the liquid seeping from the blisters on Madison’s arms and were shocked to discover a high PH level – indicating a chemical burn. ‘They decided to treat the skin by removing the blisters, so they could access the burned skin underneath,’ Martin continued. ‘They thought they would be able to soak the blisters and rub them off, but that wasn’t possible as they were so thick, so they had to cut them off. Madison has now been referred to a scar management unit and has to wear a pressure bandage for at least six months to minimise the scars covering her arm. ‘We have emailed the hotel but they said there’s nothing wrong with the henna, and it must be a problem with my daughter,’ he said. ‘When I responded I sent back a link to the dangers of it and told them to talk to their own doctor, who was trained in the UK. In an email to the family, Heike Moursy guest relation manager of Fort Arabesque Resort, Spa & Villas, said: ‘On behalf of the owner from the Beauty Center we apologize again what is happened with your daughter. ‘We don’t want to have such horrible reactions to anybody in the future again. ‘Therefore our General Manager Mr Max Shoukry have spoken with the owner of the beauty center to stop the offer of any henna tattoo.